Hello, again! It's Andrea today with a Halloween card. Now, I have to confess I'm not a huge Halloween fan (I don't do scary. ), so I don't really send out cards for that holiday. 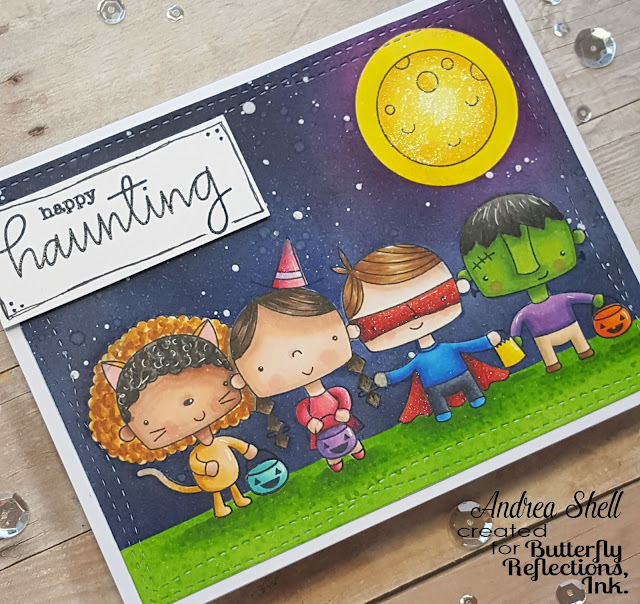 However, I DO take my kiddos trick-or-treating, and the Happy Haunting set by MFT Stamps reminded me of them and their friends. As you can probably guess, this card took alot (I mean like 3+ hours alot!) of stamping, masking and coloring, but don't you think it was totally worth it? I do! All of my images were stamped with my MISTI and Memento Tuxedo Black ink and masked with Inkadinkadoo Stamping Mask Paper. To create my background, I first masked where the sky would meet the grass with Post-It tape and then used my Mini Ink Blending Tool and Mini Ink Blending Foam and ink-blended with Mowed Lawn distress ink. I moved the mask to cover up the grass and worked on the sky. I die-cut some more masking paper with a circle die and used the negative mask to create the glow around the moon with Squeezed Lemonade and Mustard Seed distress inks. In hindsight, I wish I had not used the mask so there wouldn't be such a harsh line around the moon. Live and learn, right? After removing the negative circle mask, I covered the yellow with the leftover circle mask and ink-blended the sky. Around the moon, I used Seedless Preserves and then changed over to Chipped Sapphire. I went over all of that - lightly - with Black Soot. While my masks were in place, I flicked on some water (Not very successfully: Apparently XpressIt paper, which is great for Copic coloring, does not allow distress inks to react very well with water. Another lesson learned!) and then some watered-down white paint to create stars. Finally, I removed all of the masks, heat-set the background, and got to the fun part - Copic coloring! 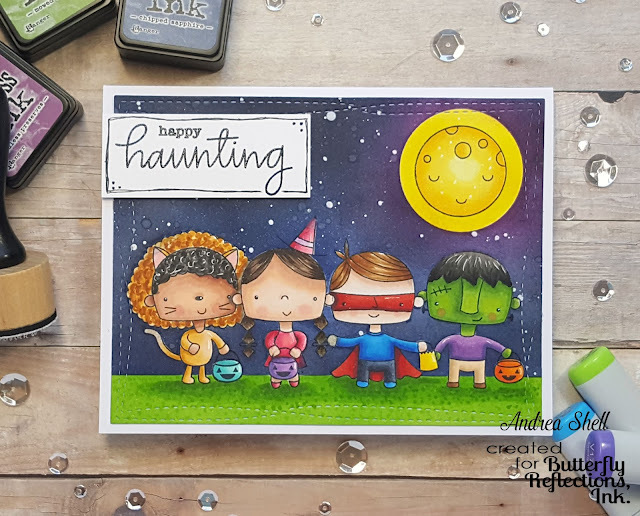 Unfortunately, all of the masks didn't stay where they were supposed to, so my distress inks colored some of my stamped images. Luckily, I was able to correct that (mostly) with my Prismacolor colored pencils. I die-cut the panel with MFT Stamps' Wonky Stitched Rectangle STAX dies and mounted it to a white card. I added some details with a white gel pen and some sparkle with Spectrum Noir Clear Overlay Sparkle Pen. I stamped the sentiment with Versafine Black Onyx Ink, sprinkled on some clear embossing powder, and heat-set it. After popping the sentiment up with foam tape, I thought it looked a bit blah, so I added some hand-drawn details with a Copic multiliner. That's all from me today. Have a wonderful day! The colouring on this is absolutely amazing! You are SO talented. Adorable card with a beautiful sky !